For over 39 years, the Imperial Beach Community Clinic (IBCC) has provided primary healthcare services to individuals and families in southwest San Diego County. Employing 90 individuals across two health clinics, IBCC has a stated goal of promoting comprehensive community health. The dedicated team at IBCC includes medical doctors, care managers, mental health counselors, and numerous support staff, many of whom are bilingual and San Diego natives. As a non-profit organization, IBCC serves as a vital source of care for some of the most underserved in San Diego County. With an established commitment to the health of its clients and community, IBCC’s Human Resources Director, Jorge Gutierrez, and Registered Dietitian, Annie Scott, saw an opportunity to turn the clinic’s health messages inward. Knowing that lifestyle choices directly impact employee health, productivity, and healthcare costs, and hoping to engage employees in pursuing healthier lifestyles, Mr. Gutierrez and Ms. Scott were immediately receptive to the idea of partnering with Live Well @ Work to establish a wellness program. Beginning with a worksite wellness assessment and strategic action planning, IBCC’s new wellness program, entitled Surfing into Wellness, was officially launched in May 2016. 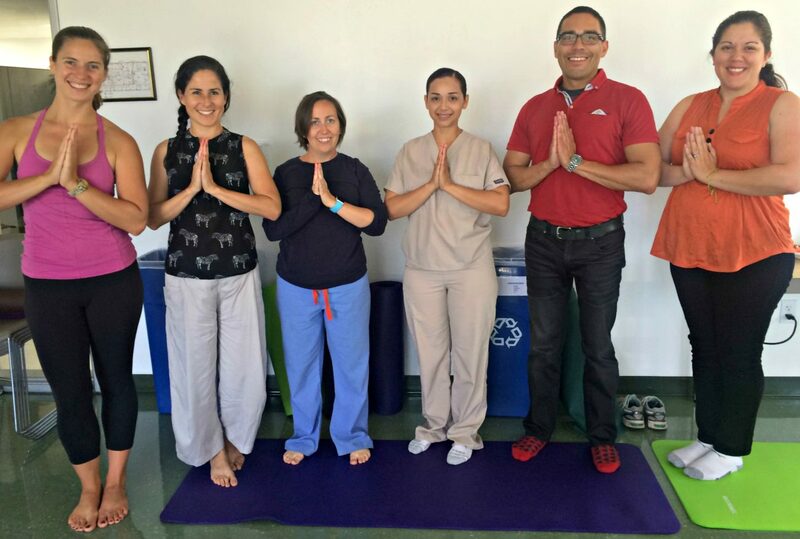 The foundation of the Surfing into Wellness program has been the wellness committee, a working unit comprised of a diverse array of dedicated employees. Over a series of paid lunch meetings, the wellness committee has successfully planned over 15 bimonthly wellness activities ranging from nutrition education sessions to beginner yoga classes. With support from Live Well @ Work, the wellness committee hosted a harvest celebration event at Suzie’s Farm, with over 50 employees and family members in attendance. IBCC’s dedication to employee wellness has continued to grow. While IBCC has several initiatives in progress, the environmental change that IBCC is most proud of has been the implementation of healthy hydration stations in the clinic break rooms. Staff now have the option of enjoying a seasonal fruit-infused chilled water beverage instead of sugar-sweetened beverages. Nicknamed ‘Water Wednesdays’, the fruit-infused water recipe is changed weekly and has quickly become a staff favorite. Further, through a partnership Live Well @ Work facilitated, IBCC has been able to install a full hydration station in an office space that previously depended on disposable water bottles. As healthcare providers, the employees at IBCC are dedicated to the values of healthy living and a high quality of life. With the success of their employee wellness program and with their commitment to program sustainability, IBCC reports that their staff are now able to be better, more informed role models for their patients and for the community that their clinics serve. Previous Article: November 20th: Market Makeover at African Caribbean Food Market in City Heights!